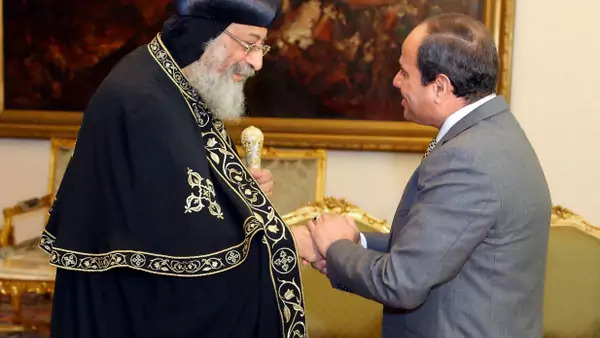 Egyptian President Abdel Fattah al-Sisi greets Egyptian Coptic Pope Tawadros II, head of the Egyptian Coptic Orthodox Church, at the Ittihadiya presidential palace in Cairo (Handout/Reuters). Sultan Al Qassemi shares stories of immigration and citizenship that helped shape the United Arab Emirates today. Thanos Petouris argues that the north-south divide in Yemen is a better lens by which to understand the Yemeni conflict than the Sunni-Shia split. Maged Atiya contends that the recent attacks on Copts in Egypt reflects a state system that has become weak and unwilling to face the country’s challenges.